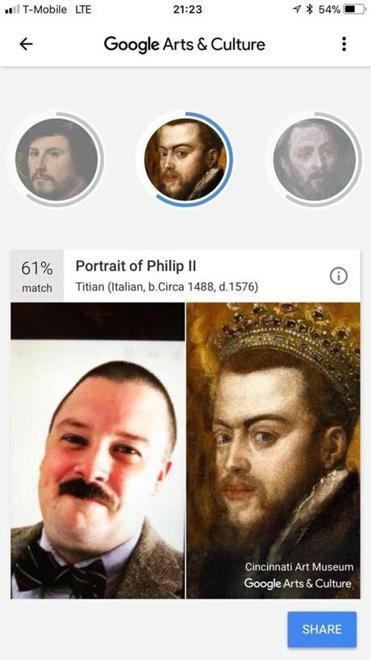 The author’s photo drew matches with multiple portraits, including this one of Philip II, through Google’s Arts and Culture app. “You use a glass mirror to see your face, you use works of art to see your soul,” wrote the great George Bernard Shaw. Shaw died in 1950, never having Googled. Had he been born that year instead, I wonder how he’d feel about the very contemporary flip of his adage. Thanks to Google’s Arts and Culture app, you can now use works of art to see your face. If you’ve been online this week, you’ve likely seen the phenomenon creeping like kudzu across the profile pics of your friends and friends-of-friends: a photo of your acquaintance in question paired with an uncanny likeness captured in oil or frozen in fresco. They are the viral fruit of a new feature on the Arts and Culture app that uses machine learning to run user-submitted selfies against a massive database of scanned paintings, drawings, murals, sculptures, objects, and other artworks from museums around the world (amassed through Google’s sprawling Cultural Institute initiative). Within days of the feature’s release, the Arts and Culture app (which had been available since 2016, offering a rich resource of art-history texts, high-definition scans, and virtual museum tours) launched to the top of the iOS and Android charts. Celebrities, journalists, and random faces in the crowd submitted their likenesses to the Great Guess Who Machine by the thousands and flooded Twitter with the results. Having run my own face through the virtual galleries of Google, I was presented by a disappointing coterie of doppelgangish faces from across the centuries. Titian’s “Portrait of Philip II” from the Cincinnati Art Museum popped up, and while it may have overstated the relationship between our eyebrows, it seemed to capture our mutual inability to grow a convincing beard. Jan Gossaert’s 16th-century “Portrait of Francisco de los Cobos y Molina,” at the J. Paul Getty Museum in Los Angeles, also scored a high match (61 percent), likely for his close-set eyes and the way he’s clutching his wallet like he knows he’s going to lose it. I saw a touch of myself in the broad strokes and wide gaze of Thomas Cool’s “Portret van de beeldhouwer Pier Pander” (1893), from the collection of Amsterdam’s Rijksmuseum. And Anthony van Dyck’s 1624 portrait of “Emmanuel Philibert of Savoy, Prince of Oneglia” (from London’s Dulwich Picture Gallery), while certainly smug enough to remind me of me, likewise failed to supply the reflection that usually draws me to art. It all makes me wonder what this project is about. Certainly the laws of Texas and Illinois serve as pointy reminders that collecting facial data is fundamentally at the root of any selfie-driven viral enterprise — and a steadily ebbing public resistance to having our faces serve as everything from passwords to credit cards is helping these endeavors along. But even atop the data-hoovering we’ve come to expect from Google, the sentiment behind the Arts and Culture selfie feature seems misguided, and I can’t tell if it’s Google’s fault or ours. Google’s ambitious plan to bring art from around the world and across the millennia and make it accessible from every desktop seems like a genuinely valuable use of the vast reach of its technology, but what does it mean that we only embrace it once we can see ourselves represented (or replicated) within it? Scrolling through the various mustachio’d extras of art history that Arts and Culture put in my personal line-up, I didn’t feel any real correlation between me and my matches. After a few minutes and a couple of giggles, I was bored. Sure, the technology is impressive, but it left me wondering if Google (or Alphabet) (or any of us) remembers why we come to art in the first place. Art, after all, is largely about difference, uncertainty, the unsearchable query. I found myself wishing for a deeper form of artificial learning. An app that could scan my e-mails for petty frustrations and serve up the perfect Rothko to get lost in. Or clock my heart rate and find the right “Gymnopedie” to play. Or at the very least, a way for technology to channel art’s qualities as effortlessly as its quantity.